Friday Night Live - Supporting our customers, supporting our industry. FNL is a project to help enthusiasts (and professional detailers) understand what we do. We offer advice for maintenance and repair of vehicles from a detailing perspective in a very relaxed format. We're committed to a new high quality video on the last Friday of each month right here in this blog. Please support us and our sponsors. The sponsor of this show was Bergamot Australia who supplied the exquisitely quenching Calabrian beverage, more goodies at their site and as always, Bespoke Imaging, Melbourne's finest automotive photographers and videographers. 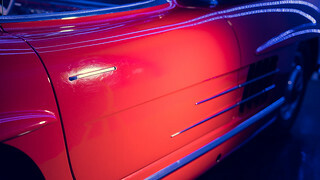 This has been released earlier than usual because we wanted it ready for Christmas, we leave the format of monthly videos with a gorgeous '55 300SL Roadster in a magnificent red gloss that is absolute perfection, we also answer customer questions regarding our double-ended polish bottles, glass pads with the Velvet Revolver, random orbitals vs rotary polishers, Damian has fun with a customer who is just begging for a joke to be had and lots more. GSP's (Glass System Pads) are the corrective tool you can attach to your buff, whether it be a rotary, forced rotation or random orbital, they are lubricated with polish, CAP Heavy is our recommendation and will achieve significantly more correction than any foam or microfibre pad can offer on glass. As Damian warns, GSP's are not at all forgiving and the chances of damaging soft rubbers or trim around glass is high if those materials aren't protected. The best way forward is to tape them up, Damian recommends doubling up the tape for extra protection as 'masking tape is cheap insurance'. The best pad size for the VR (Velvet Revolver) and other random orbitals is 75mm, The Velvet Revolver is a clutching mechanism which reduces or cuts power completely from the pad if the load is too great, this is what makes the VR such a forgiving machine, so using a large 135mm GSP can create too much friction and the clutches will kick in, reducing your ability to take advantage of the bigger pad. A more powerful machine without clutches is recommended if you're wanting to cover large areas quickly, but a large orbit random orbital is NOT recommended as it is very difficult to polish close to edges with large orbits. This is one of the downsides of large throw orbitals. Prepping the glass by washing is essential of course and decontaminating it with an Eraser (or clay bar) is highly recommended. A small pea-sized drop of CAP Heavy is recommended to provide some abrasive cutting characteristics and to lubricate the pad. Working times are usually 1-2min for a section about 10cm2. Remove the residual polish with Paint Cleanse and a NanoFibre Paintwork Cloth and when you've completed all the glass correction, seal with your favourite sealant such as Full Metal Jacket Spray Wax or Paint Protection.